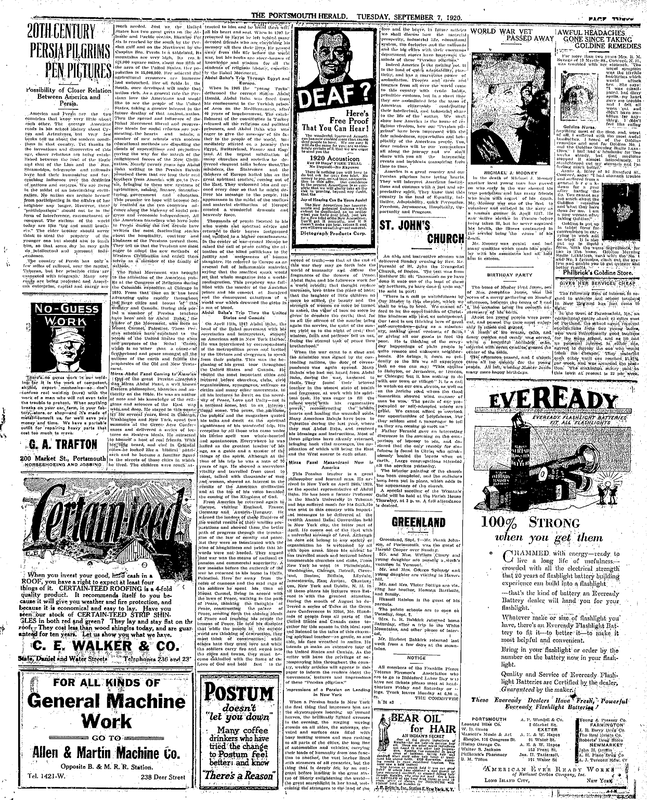 Today’s article from 90 years ago is from The Portsmouth Herald, and is probably one of the most openly positive pieces I’ve ever read in a newspaper. It begins with relations between the US and Persia, then talks for a long, long while about the founder of the Baha’i faith (1920 was one year before he died), and then back to a bit on Persians arriving in New York for the first time. Possibility of Closer Relation Between America and Persia. America and Persia are the two countries that know very little about each other. The average American reads in his school history about Cyrus and Artexerxes, but very few books tell us about the modern conditions in that country. Yet thanks to the inventions and discoveries of this age, closer relations are being established between the land of the Eagle and that of the Lion and the Sun. Steamships, telegraphs and railroads have had their humanizing and far-reaching influence over the destinies of nations and empires. We are living in the midst of an interlocking civilization. No nation can seclude herself from participating in the affairs of her neighbor any longer. However, these “participations” should not be in the form of interference, encroachment or conquest. The nations of the world today are like “big and small brothers.” The elder brother should never think to steal the property of the younger one but should aim to teach him, so that some day he may gain his intellectual and personal independence. The country of Persia has only a few miles of railroad, near the capital, Teheran, but her principle cities are connected with telegraph. Many new roads are being projected and American enterprise, capital and energy are much needed. Just as the United States has two great ports on the Atlantic and Pacific oceans, likewise Persia is reached by the south by the Persian gulf and on the Northwest by the Caspian Sea. Persia is a tableland, its mountains are very high, its sea is 628,000 square miles, about one fifth of the area of the United States. Her population is 15,000,000, her mineral and agricultural resources are immense and untouched. Her oil fields in the South, once developed will make that nation rich. As a general rule the Persians love the Americans and would like to see the people of the United States taking a greater interest in the future destiny of that ancient nation. Thru the spread and influence of the Bahai Movement liberal and progressive ideals for social reforms are permeating the hearts and minds, a number of new schools with modern educational methods are dispelling the clouds of superstitions and prejudices paving the way for the march of the enlightened forces of the New Civilization. Nearly twenty years ago Abdul Baha writing to the Persian Bahais promised them that ere long their real brothers from America will go to Persia, bringing to them new systems of agriculture, mining, finance, manufacturing, government and education. This promise we hope will become fully realized as the two countries advance along the highway of social progress and economic independence. All the American travellers who have been in Persia during the past decade have written the most fascinating stories about the hospitality, courtesy ad kindness of the Persians toward them. They tell us that the Persians are most eager to adopt the new methods of Western Civilization and enroll themselves as a member of the family of nations. The Bahai Movement was brought to the attention of the American public at the Congress of Religions during the Columbia exposition at Chicago in 1893. From that time on it has been advancing quite rapidly throughout the large cities and towns of this country and Canada. During this period a number of Persian teachers have been sent by Abdul Bahai, the leader of the Movement, who lives on Mount Carmel, Palestine. These Persian scholars have explained to the people of the United States the aims and purposes of the Bahai Cause, which is no other than a cause of Brotherhood and peace amongst all the nations of the earth and fulfills the prophesies of the Old and New Testament. One of the great Persian teachers was Mirza Abdul Fazel, a well known Eastern philosopher, historian and authority on the Bible. He was an author of note and his knowledge of the religions and sciences of the East was wide and deep. He stayed in this country for several years, lived in Chicago, Washington and New York, spent two summers at the Green Acre Conferences and delivered a series of lectures on Eastern ideals. He attracted to himself a host of real friends. With his long beard, and clad in Oriental robes, he looked like a biblical patriarch and he became a familiar figure in the streets of those cities in which he lived. The children were much attracted to him and he loved them with all his heart and soul. When in 1903 he returned to Egypt he left behind many devoted friends who are cherishing his memory all thru their lives. He passed away from this life before the world war, but his books are store-houses of knowledge and wisdom for all the students of religious history, especially the Bahai Movement. When in 1908 the “young Turks” dethroned the corrupt Sultan Abdul Hamid, Abdul Baha was freed from his confinement in the Turkish prison of Aeca on the Mediterranean, after 40 years of imprisonment. The establishment of the constitution in Turkey released all the religious and political prisoners, and Abdul Baha who was eager to give the message of his father to the people of the world, immediately started on a journey thru Egypt, Switzerland, France and England. At the urgent solicitation of many churches and societies he delivered eloquent talks before them. The ministers, the Statesmen and the thinkers of Europe hailed him as the great spiritual teacher, coming out of the East. They welcomed him and opened every door so that he might deliver his message to the people. His appearance in the midt of the soulless and material civilization of Europe created a wonderful dynamic and heavenly force. Thousands of people listened to his wise words and spiritual advice and returned to their homes invigorated and uplifted to a higher consciousness. In the center of war-crazed Europe he raised the call of peace calling the attention of the blind politicians to the futility and uselessness of human slaughter. He referred to Europe as an arsenal full of inflammable material, saying that the smallest spark would set that whole magazine into a world-conflagration. This prophecy was fulfilled with the murder of the Austrian prince and his consort at Sarajevo and the consequent cataclysm of a world war which drowned the globe in a sea of blood. On April 11th, 1912 Abdul Baha, the head of the Bahai movement with his secretaries and interpreters, stepped on American soil in New York Harbor. He was interviewed by correspondents of the metropolitan press and invited by the Divines and clergymen to speak from their pulpits. This was the beginning of his great tour throughout the United States and Canada. He visited the most important cities and lectured before churches, clubs, civic organizations, synagogues, suffrage societies and many other movements. In all his lectures he dwelt on the necessity of Peace, Love and Unity — not in a national sense, but in an international sense. The press, the platform, the pulpits and the magazines quoted his talks and dwelt on the spiritual significance of his wonderful trip. His reception by all those who came under his Divine spell was whole-hearted and spontaneous. Everywhere he was hailed as the greatest teacher of his age, as a guide and a master of the things of the spirit. Although at the time of his trip he was a man of 70 years of age. He showed a marvelous vitality and travelled from coast to coast, talked with thousands of men and women, showed an interest in the results of the American civilization and at the top of his voice heralded the coming of the Kingdom of God. When the war came to a close and the armistice was signed by the contending nations, the door of correspondence was again opened. Many Bahais who had not heard from Abdul Baha, during the war, hastened to Haifa. They found their beloved teacher in the utmost state of health and fragrance, at work with his spiritual task. He was eager to fill the ruined world with his regenerative power, reconstructing the broken hearts and healing the wounded souls. Many American Bahais have been to Palestine during the last year, where they met Abdul Baha, and received his blessings and instructions. Most of these pilgrims have already returned, bringing back vital messages, the application of which will bring the East and the West nearer to each other. Indeed America is the melting pot. It is the land of quick adaptability, plasticity, and has a marvelous power of assimilation. Peoples and races and tongues from all over the world come to this country with crude habits, primitive customs, but in a short time they are assimilated into the mass of American citizenship, contributing their intellectual, and industrial share to the life of the nation. We shall show how America is the name of religious freedom, how our “Persian pilgrims” have been impressed with the fair mindedness, appreciation and hospitality of the American people. You, dear readers, will be our companions all along the journey and we shall share with you all the intervening events and incidents transpiring from time to time. America is a great country and our Persian pilgrims have loving hearts. They will interpret American institutions and customs with a just and appreciative spirit. They know that this country is the land of Equality, Initiative, Adaptability, quick Perception, Freedom, Joyousness, Hospitality, Opportunity and Progress.